Beautyqueenuk | A UK Beauty and Lifestyle Blog: Magazine Freebies July 2016! This month see's some absolutely amazing Magazine Freebies, making up for a few months where there has either been none or there is just one or two pretty decent ones, if you follow me on Instagram, I have featured them for this month. The best so far has to come from Elle Magazine and they have a collaboration with Benefit. 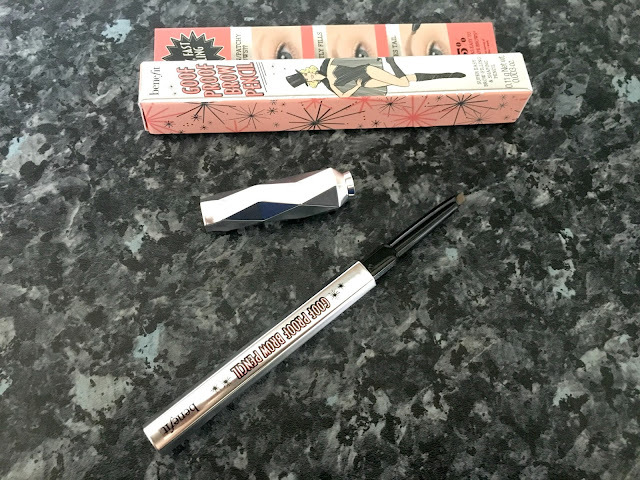 If you haven't seen or heard by now, Benefit will soon be launching (24th June) a whole new Brow collection, which I have had a sneak peek of and it is pretty fantastic, keep your eye out here for more information. 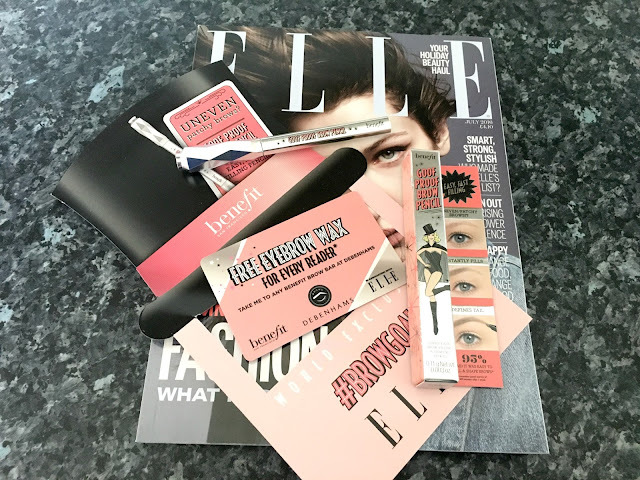 That said, in Elle Magazine this month, you can get your hands on one of those brand new products - Good Proof Brow Pencil and it is the product I think I am likely to reach for the most. 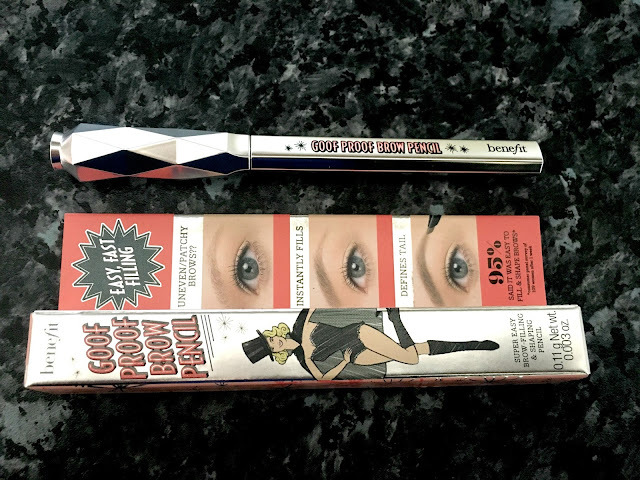 Goof Proof Brow Pencil features a tip which is angled and pointed, so you can create any kind of finish you like. You can build colour, add definition, fill and shape your brows all with this one pencil. If that isn't enough, there is no need to sharpen this pencil because it is a twist-up pencil. As you can see it looks stunning in its chrome packaging, but that is not all you get free with Elle. Are your brows in need of taming? Well also included this month is a card which entitles you to a free Brow Wax at any Benefit Brow Bar at Debenhams and it is valid right up until 31st July! Red Magazine gives a free luxury Rodial eyeliner duo in black and brown and that is worth a massive £34! Marie Claire has a fabulous offer from Elemis with the choice of a Hydra Boost Day Cream or a Hydra Nourish Night Cream both in 15ml tubes. Instyle is offering a choice of Eyeko freebies in the form of a black mascara, eyeliner or brow gel. Glamour is offering free make-up from Model Co in the form of a Lipgloss, Eyeliner, Lip liner or Mascara. What do you think to the current freebies on offer? Have you got any of them? The free sunnies in Tatler caught my eye yesterday, not sure I would really want to read the magazine though! I love magazine freebies, the eyeko mascara last time was quite good so I'll have to pick all the magazines up again! I love magazine freebies I'll definitely have to get Elle for the brow pencil. This is such a helpful post for someone like me, who rarely buys the same magazine twice - now I know where to point my debit card this month! Ooohh I love Benefit! Thanks so much for pointing out this freebie, I'll definitely be picking it up for the free wax voucher! I haven't bought magazines for a long time I should start looking into getting them for the freebies! 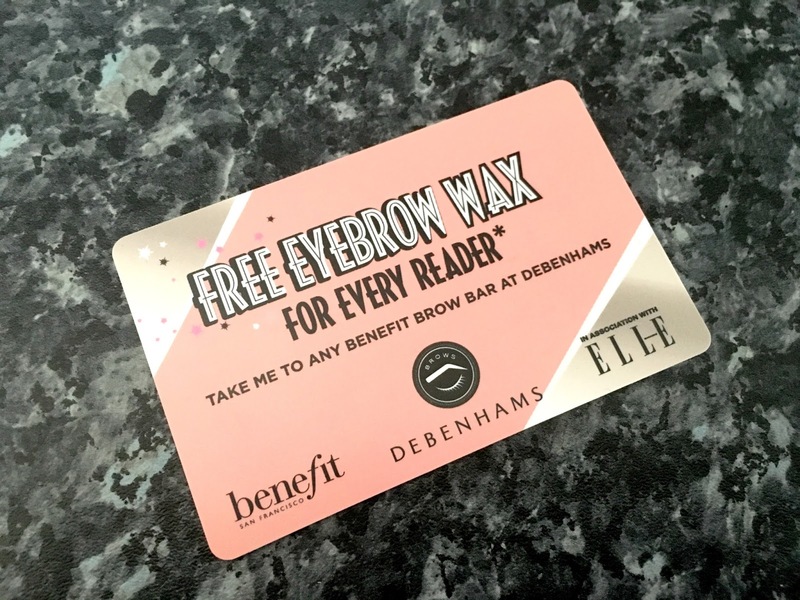 That benefit brow and free wax is something I would like so I think I need to buy Elle magazine. I did not realise how much you could get for free. I need my eyebrows doing before I go to Britmums and another blogging event. Could do with a voucher! I do love "freebies" you get from mags, but I noticed when you subscribed to them... You hardly get any freebies unlike the store bought ones.... Or maybe it's just Ideal Homes? Oooo... Elemis offer sounds rather good. I love their skin care products. What a lovely freebie! Will definitely be picking up a copy of Elle this month! Thanks so much for sharing these i love magazine freebies, better look out for these! What an awesome freebie! I can't wait to try this collection! Such great freebies! There's something really quite satisfying getting something extra for free when you buy an item. The freebies are so good this month. I am loving them. I used to spend so much money on magazines just for the good freebies! (Remember when Glamour mag had all the benefit minis?!) Nowadays I barely buy magazines! Oooo I do love a good freebie, but I'm in love with my S&G archery pen so I don't think I'll be getting this one :). I love the freebies on magazines this month but this Benefit pencil is the best one! I picked this up too and I quite like it :) I may pick up the Rodial eyeliner if I see it, my Asda didn't have the July issue in yet! Cool freebies!! I think I need to get myself to WHSmiths and pick up some magazines! I'll go for the sunglasses from Tatler Mag. Sun is coming now heavily so perfect everytime I sip a cup of coffee outside. Buy the magazines in WHSMITH - last month Marie Claire was £2.50 and came with the free 50ml Neals Yard hand cream. It appears WHSMITH have a deal with Marie Claire and each month undersell the other retailers by 1.50. Save £1.50 or buy 2 magazines for both free gifts. I have just brought Elle just because of the Benefit product.